The hoard of copper alloy coins, dating from the 3rd Century, was unearthed in Montgomery, Powys, several weeks ago. About 900 were found by a member of a Welshpool metal detecting club, with the rest of the discovery made with help from archaeologists. The exact location is being kept secret to protect the site. The Powys coroner will determine whether they qualify as treasure. 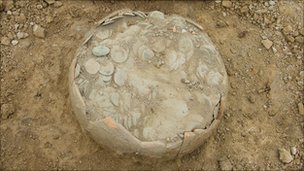 Clwyd-Powys Archaeological Trust (CPAT), which helped unearth the coins, said the discovery had the potential to reveal more about Roman life in mid Wales in the late 3rd Century. The find in Montgomery is a few miles away from where a Roman fort once stood in the village of Forden. The majority of the coins were found buried in a ceramic pot, said the trust. 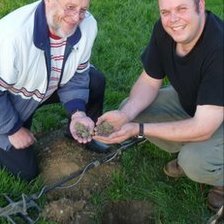 The initial discovery of more than 900 coins was made by Adrian Simmons, a member of Welshpool's Oldford Force Team metal detecting club in June. He called in the trust, who excavated the site on 5 July, finding more than 2,000 coins. Chris Martin, regional archaeologist at the trust, said: "We are very excited about this discovery and are very grateful to Mr Simmons for acting so responsibly and to the landowner for his support. "The hoard has the potential to tell us more about Roman life in mid Wales in the late 3rd Century AD. "This was probably a time of considerable political and economic unrest and the coins may have been buried for safekeeping with the intention of returning for them in the future. "Unfortunately for the original owner, but happily for us, for some reason they never had the chance to recover them." The coins were taken to the National Museum Wales in Cardiff, where an expert is writing a report. This will be passed to Powys coroner Peter Maddox, who will decide on what happens to the coins, and whether the finder is entitled to a fee if they are ruled to be treasure.